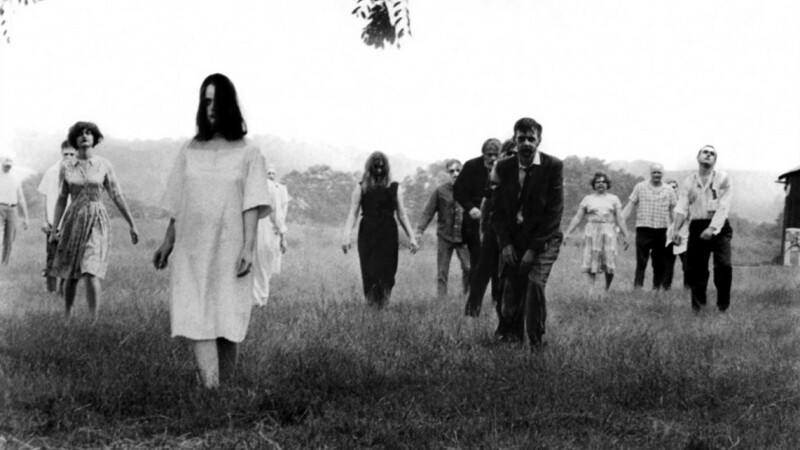 For a variety of reasons, I have never seen any of the sequels to George Romero’s original Night of the Living Dead — well, unless you want to count Dan O’Bannon’s gruesomely amusing The Return of the Living Dead (1985) — perhaps I’ve always considered it a tough act to follow. Or, more likely, because I don’t think any audience response to any sequel (or remake) — at any time, anywhere — could top the one I noted, and shared, when I first saw Romero’s classic 1968 horror opus during my college days. While I was attending Loyola University in New Orleans back in the 1970s, I attended an evening screening in a large auditorium on campus. The crowd (including me) was impressed and attentive. Indeed, at least one of my fellow students may have been a little too impressed and attentive. The first time a group of the shambling undead appeared on screen, a shriek rang out from the darkness: “Don’t let them get me! Don’t let them get me!” At first, I figured someone was goofing off, or encouraging some kind of audience participation. (Little did I know that, only a couple years later, such behavior would become commonplace at midnight screenings of The Rocky Horror Picture Show.) But then it happened a second time. Louder. And a third time. Louder still. By that point, it was quite obvious that whoever was screaming was totally, unabashedly, nearly-scared-to-death terrified. After the third outburst, two people — friends? faculty? security personnel? I never found out — more or less lifted this frightened fellow from his seat and carried him (gently, as far as I could tell) out of the auditorium. But not before the guy had managed to make some of us (again, including me) even more uneasy while watching Romero’s masterwork. Maybe his fear was a natural reaction, maybe it was, ahem, chemically enhanced. But, either way, that fear obviously was contagious. And how do I know this? Well, here’s the thing: None of the other people in the audience laughed when he screamed the second and third times. Come to think of it, as I recall, no one told him to shut the hell up, either. George Romero passed away Sunday at age 77. He often is credited with starting the zombie movie genre – even though no one in his Night of the Living Dead ever actually uses the term “zombie” to describe the reanimated corpses that makes such nuisances of themselves. I’ll leave it up to others whether he deserves that acknowledgement. All I can say is, all these years later, I smile whenever I think of the night he enabled me to experience something that was, you know, really scary.